You already know that breakfast is the most important meal of the day, but sometimes it can be so darn boring. 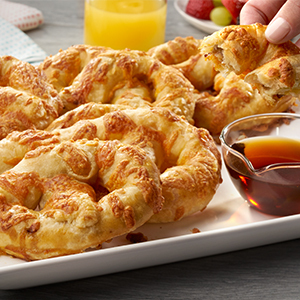 Well weve livened it up with a Stuffed Breakfast Pretzel that takes flaky pastry and fills it with sweet orange marmalade, smoky sausage and sharp Cheddar cheese  This is one breakfast that you wont want to skip. Heat the oven to 375°F. Line a baking sheet with parchment paper. Sprinkle the flour on the work surface. Unfold the pastry sheet on the work surface. Cut the pastry sheet into 3 strips along the fold marks, then cut each strip in half lengthwise, making 6 strips in all. Roll each pastry strip into a 16x3-inch rectangle. Brush half of each pastry strip (lengthwise) with the egg mixture (reserve any remaining) then brush the marmalade down the middle of the pastry strips (avoiding the edges). Sprinkle 2 1/2 tablespoons cheese and 1/4 cup sausage down one side (lengthwise) of each pastry strip. Starting on the side with the filling, roll up the pastry to form a long rope, pinching the ends to seal. 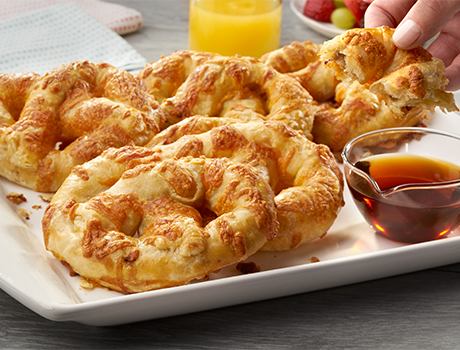 Shape the rope into a pretzel shape (not too tight- it will need space to puff- and brush a bit of egg under the ends to help them stick together) and place it onto the baking sheet. Brush the Puffzels with the egg and sprinkle with the remaining cheese. Bake for 25 minutes or until deep brown. Let the Puffzels cool on the baking sheet on a wire rack for 10 minutes.